There have been a whirlwind of events over the past several weeks, many opportunities to get our community together. The next few days provide a wonderful opportunity to spend some time with close family and friends as we celebrate the Thanksgiving holiday. I remember at my parents’ Thanksgiving table my father always pointed out that Thanksgiving had its underpinnings in the Jewish holiday of Sukkot. Regardless of how large or small our gathering was, we would all embrace one another shoulder to shoulder (Think Hinei Matov) as Dad recited the blessings including the Schechyianu (see Laura Seymour’s column for more about incorporating Jewish elements into your Thanksgiving celebration). From the TJP family to yours, A healthy, happy and meaningful Thanksgiving holiday. 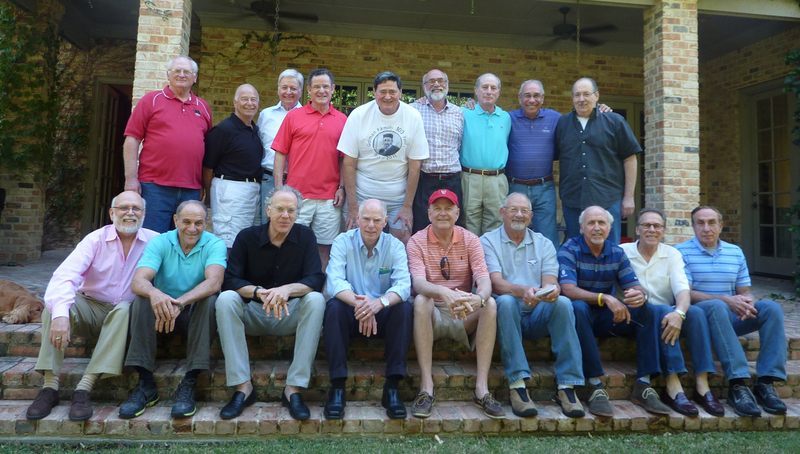 Martin Golman was kind enough to share a photo with us from a Kaplan AZA luncheon that was held the weekend of Oct. 14-15 celebrating the Hillcrest High School 50 year reunion. The highlight of the Kaplan Gang reunion was a good and welfare of memorable stories. There are exciting thing going on at the Museum of Biblical Art, across from Northpark Mall in Dallas. Last weekend, the museum dedicated a painting, “Tree of Life” from Maya Eventov, one of Canada’s most successful artists. The mixed media painting captures the deep symbolism of the tree of life described in the book of Genesis. Eventov, who happens to be the cousin of Dallas’ Myra and Phil Migicovsky, is best known for her popular landscape paintings sold in fine art galleries throughout the world. An exhibition of Eventov’s paintings opened November 19 at Galerie Zuger located at 1215 Dragon Street in Dallas. A formal museum dedication of the “Tree of Life” painting was held on Saturday Nov. 19. Also at the museum, the Consulate General of Israel to the Southwest region and Bnai Zion will present esteemed architect, Ganit Mayslit Kassif, on Wednesday Nov. 30 at 1:30 p.m. The architecture firm Mayslits Kassif Architects, co-owned by Ganit and her husband, transformed the neglected port of Tel Aviv, Israel into a vivacious, breathtaking waterfront multiuse development. The Tel Aviv port was primarily an operational docking port until its abandonment in 1965. Today, the port’s regeneration is considered one of the most influential public spaces in Tel Aviv, and houses various restaurants, shopping centers, and bars drawing natives and tourist alike. The museum of Biblical Art is graciously providing a lunchtime lecture by Kassif that will be open to the public. The lecture will primarily focus on the revitalization of the port of Tel Aviv, as well as the general style of architecture that can be found in the “White City” of Tel Aviv. With the recent creation of a devoted gallery space to Israeli artists, the visit by Kassif is a new broadening of the museum’s vision as it continues to encourage the arts produced within Israel. Kassif will also be visiting the campus of the University of Texas-Arlington as well as the University of Houston. The lectures will provide a brief outline on the urban history of Tel Aviv, and will focus on some recent projects of Mayslit’s Kassif Architects. Challenging the sharp contrast between private and public space, the projects will expose the search for contemporary public spaces, which serve as vital urban living rooms and become a fertile social and cultural ground. VistaCare Hospice, part of the nationwide family of Gentiva home health and hospice companies, joins in celebrating National Hospice Month. Every November, this observance honors hospice workers — including nurses, aides, social workers and administrators — who make a remarkable difference in the daily lives of patients and their families. Hospice services involve providing expert medical care, pain management and emotional and spiritual support to patients primarily in their homes or other type of residence. It is designed to ensure each person’s right to die pain-free and with dignity, and see that patients’ families receive the support necessary to encourage this type of care. While hospice services continue to increase across the country, some common misconceptions that may prevent timely access to this important end-of-life care still exist. The annual celebration of National Hospice Month serves to educate Americans about hospice service and dispel myths about it. Patients, family caregivers, physicians and other referral sources who wish to learn more can contact Vistacare at 214-231-3914. Mazel tov to Susan Candy Luterman of Dallas who was elected president of the International Association of Hebrew Free Loans at its annual conference in Montreal in September. Susan is a third generation member of the Dallas Hebrew Free Loan Association, following in the footsteps of her grandfather, Abraham Samuelsohn, and her father, Yale Candy, both of blessed memory. She became involved in 1993 and in 2001 became the first woman to be president of the Dallas organization, which was founded in 1935. Susan is the daughter of Florence and Yale Candy, granddaughter of Sadie and Abraham Samuelsohn and niece to Martin Samuelsohn, all of blessed memory. She has been married to Allen N. Luterman, also of Dallas since 1964. Susan and Allen have two children, Stephen Luterman and Adrea Luterman and three grandchildren. She was a wholesale jeweler by trade, designing diamond jewelry. The International Association of Hebrew Free Loans was founded in 1982, to bring the various free loan organizations together to network, help and learn from each other. Based in Los Angeles, California, the association has over 40 free loan member organizations, from cities in the U.S.A , Canada, Israel, Argentina, and Australia. For information about International, please visit their website at www.freeloan.org. The Republican Jewish Coalition, North Texas Chapter will host a 2012 Presidential Election Season Primer, Sunday Nov. 27 at the Aaron Family JCC, 7900 Northaven Road. Beginning at 9:30 a.m., the group will review the positions of the presidential candidates. There is no charge and the community is invited to attend.